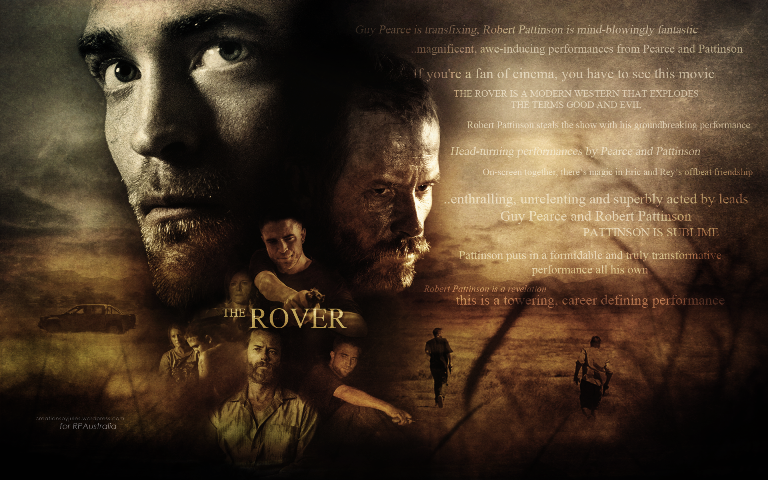 The promotional materials for The Rover market it as a post-apocalyptic movie. However, it’s not your typical fare in the just mentioned genre. It’s devoid of the robots in District 9, the aliens in Independence Day, the zombies in World War Z, or the inorganic-looking monsters in Edge of Tomorrow. In fact, the movie could pass as a modern-day thriller if not for the reminder at the very beginning of the film – a text overlay that says “10 years after the collapse in Australia”. Take away this overlay and you get a movie that’s set in the present time. There’s absolutely no sign to suggest that the events in the film happened in the 2030s or 2040s or beyond. But somehow, this is the very same thing that makes this film unique and engrossing. It gives the film a layer which elevates its entertainment value. It gives the film additional suspense because the nagging question mark about the “collapse” keeps on hovering at the back of your head. Are they going to reveal more details about what exactly happened? Why does the Australian country-side look like a carbon copy of a dust-filled valley during the American Depression? Unfortunately, The Rover is not about any collapse or apocalypse. The collapse is merely a minute backstory. So if you’re expecting spectacle about a world in chaos like the scenes seen in World War Z, you won’t get any of them from this film. The Rover is more of an in-depth study of human emotions and reactions in a world that has gone to the pits. The Rover stars Guy Pearce, Robert Pattinson and Pearce’s magnificent beard. It opens with a close-up of Pearce’s face. In pain. Jaws locked. A million tears imprisoned inside his eyes. Ready to burst out but the time is yet to come. A lot of the scenes in the film are lingering close-ups of the two lead characters played by Pearce and Pattinson. It sounds like a bad idea but it’s really one of the strongest points of the film. Every time the camera pans into a close-up of either character, you get to read what’s happening in their heads. They move the story forward through their expressions and emotions. And it’s beautiful to behold. When it comes to plot, The Rover doesn’t have much to offer. Basically, it goes this way. Some hooligans steal Pearce’s car. Pearce goes after them. Pearce accidentally bumps into Pattinson who turns out to be the younger brother of one of the thieves. Pearce takes Pattinson hostage and orders him to take him to his brother’s hideout. Along the way, Pearce and Pattinson develop a bond they didn’t quite expect. All these lead to the final confrontation at the end. Pearce is brilliant as always. He plays a man carrying a heavy burden and he is very convincing doing it. You can put the man in a bare room and he’ll create a world of tension and suspense with just a heave of a shoulder or the roll of an eye. One of the greatest surprises in this movie is Pattinson’s performance. The man can act if given a role wherein he really has to act as opposed to his stolid appearances as a pale-faced vampire in the much-panned Twilight movie series. In The Rover, he plays a clueless but dangerous young man. He is the very definition of vulnerability. He mumbles. He stumbles. He rolls his eyes in confusion. He twitches his lips in uncertainty. He’s just an innocent half-wit caught in an environment overflowing with guns and violence. There is just but one light and funny moment in the film. Out of nowhere, a pop song starts playing in the background as Pearce and Pattinson walk across the Australian desert. You get a bit of a jolt. It’s a what-the-hell moment. Then we see Pattinson mouthing some of the lyrics of the song – “Don’t hate me because I’m beautiful.” The half-wit that he is, his face twitches and contorts. This is probably the only time you’ll ever laugh or at least chuckle in the duration of the film. One thing about the film that seems strange is the prevalence of Asians. There are Asians everywhere. There’s what looks like a road-side shop with a Thai sign on top of it. There’s Vietnamese music playing during the opening scene. Pearce kills at least two Asians. In conclusion, The Rover is an entertaining film. Some people may find it boring because its pace sometimes goes too slow. Some people may find the thin plot off-putting. Aside from these, it’s a really well-made film. The cinematography is more than decent. The acting is superb. And the action scenes are unique in the sense that they’ll surprise you. There’s once scene involving a dwarf that can catch anyone off-guard with the way it played out.